I learned of this Do it yourself method of how to make a solar-powered outbuilding or garage heater through The Energy Blog (by Jim Fraser). With some simple ingenuity and a list of needed materials and tools from the website BuiltItSolar.com even an average weekend handyman can pull off this project. I am tempted to try it myself on my south facing attached garage since I sure would like to be able to use that for winter time projects. The inventor is Gary Reysa, a retired airplane product development engineer. 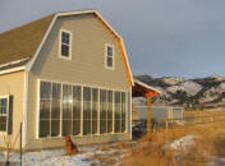 He has posted his 6 page PDF plan of how to build a suitable solar heat system through Home Power Magazine. There are plenty of other solar related thought-provoking projects on his website.